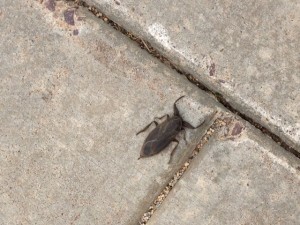 Giant Water Bug found on campus. streams and ponds for most of their lives. Giant water bugs use a pointy protrusion at their rear end to act as a snorkel, allowing them to breath air while swimming about. Using their menacing pinchers, giant water bugs prey on tadpoles, fish, even baby turtles and water snakes occasionally. Also, watch out, because even though their pinchers are basically harmless to us humans, they can draw blood if given the chance to get you in their grasp! When the giant water bug reaches maturity, they will fly away from their water source to find a mate before dying. Now let us leave you will an interesting fact for the day: these giant water bugs also happen to be a delicacy in parts of southeast Asia.